Todd James Pierce has achieved a remarkable feat. With his new book, Three Years in Wonderland, he has managed to pull away the dark shroud of speculation that has surrounded the mysterious and stormy relationship between Walt Disney and the larger-than-life con man CV Wood, Disneyland's first general manager. Most of you may already know that CV Wood served Walt Disney steadfastly during Disneyland's difficult birth, building phase and first year of operation. Many of you may even know that the relationship ended poorly and that, from the earliest days, the Disney Company scrubbed any mention of Wood and his suspect shenanigans from their official history; treating Wood's contribution as an unmentionable little secret. 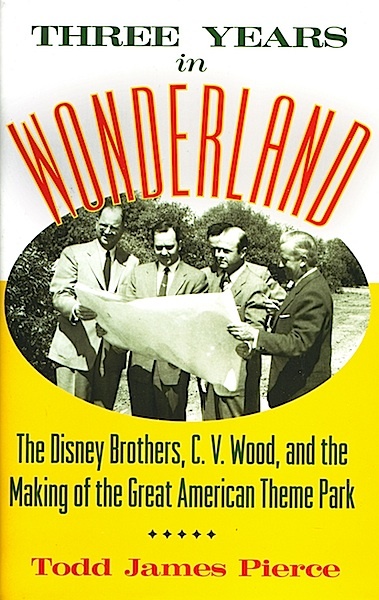 While the dust jacket entices the reader with 'The Making of the Great American Theme Park', the book is primarily concerned with Disneyland. That's just as well because, after reading this masterful work, a second more comprehensive look at CV Woods important contributions to the theme park industry is nearly demanded - and would be a blessing. Pierce is clearly up to that challenge, as well. One can only hope. To be sure, the well read Disney enthusiast will find some familiar ground here in Three Years in Wonderland, faithfully repeated from other rare sources and previously published books. However, what Pierce does with the existing material is astonishing. Here, in this book, he concisely brings each nugget of information into a more proper context and reveals something fresh - and often jaw dropping or newly discovered - to enhance the existing narrative. Each successive page leads the reader in a steady, anticipatory march towards the final, stunning Chapter Seven where everything comes to a decisive head; an explosive confrontation at the Mickey Mouse Club Circus, of all places, between Walt and CV Wood. It's jaw dropping to imagine the scene. This is a powerful, revelatory book. Any serious student of Disneyland history should anxiously guide their mouse towards Amazon immediately upon finishing this sentence. I finally got my copy, and am really looking forward to reading it! C.V. Wood has been something of a mystery for decades. Let me know what you think, Major. I really enjoyed this book (bet you can't tell!). There are some really fascinating revelations in it. Maybe even a new reason for the demise of Fantasyland's Pirate Ship!